cyberREN offers a complete suite of transplant functionality to automate and improve the clinical management of the transplant program within a renal care facility. Purpose: An indication of all the steps required to move a patient to the Transplant List, as well as the status of each preparatory step. 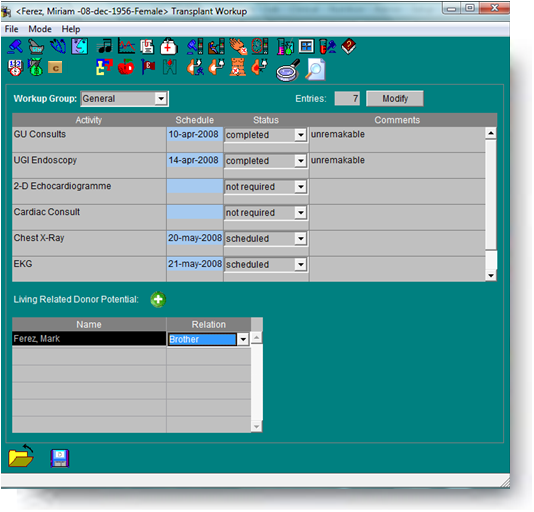 Transplant Workup catalogue functions allow the user to define a set of assessments which are required in the general transplant workup process, and which apply to each patient individually. cyberREN offers a comprehensive, user definable transplant workup function, to assist in maintaining an accurate Transplant List. cyberREN allows the care-giver to manage potential transplant recipient activities including the planning, ordering, and tracking of the associated preparations and workups. The complete patient chart is transferred along with the patient from a dialysis treatment modality into the transplant modality, all past records pertaining to the patient are available to the transplant follow-up team. All areas of transplant activity are supported including pre-transplant analysis and preparation as well as recipient monitoring. Anonymous donor support is provided, with a donor history, tissue typing functions and cross match information. A complete transplant record supports charting of the surgical processes, including the preparation and preservation of the kidney, and other organs which may have been harvested. cyberREN further assists in the management of transplant therapy by providing the electronic charting of transplant operation details, organ rejection incidents and their related treatment, and biopsy results. Transplant patient population management is supported by a comprehensive spreadsheet function calculating mortality rates and other long-term indices, kidney function and associated dosages of transplant medications. ODBC based access allows third party statistical tools to query the cyberREN database in a flexible manner. A complete set of transplant related, user modifiable, standard data catalogues complement cyberREN’s transplant functionality, fostering consistent charting and allowing a statistical analysis of most chart content.